Photolalia: Trona -- Some images... and a few brief words about them. 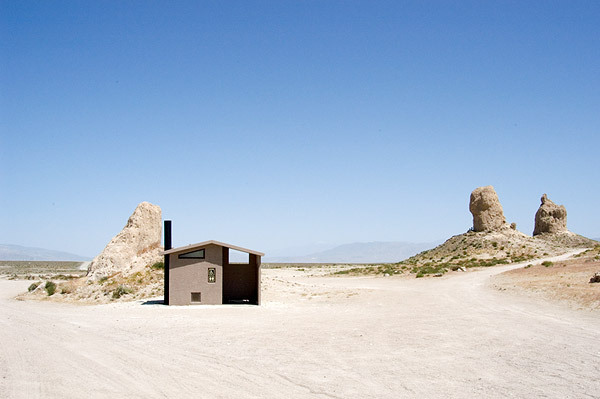 (Trona, 2005. Image copyright Hamish Reid). There it was -- walking through Trona Pinnacles, earlier this year, I stumble across some sort of alien space ship plonked down in the middle of the desert, all hard angularity surrounded by the astonishing softer shapes and textures of the Pinnacles (you just have to go there to see the Pinnacles yourself). Yes, it really does look like this. I was enchanted. Much more my photographic style than the Pinnacles themselves. Well, at least as far as images go (actually walking through the Pinnacles was a dream, the sort of dream I just don't bother interrupting with a camera...). Talk about desolate. Another beautiful landscape. I know absolutely nothing about this area of the country, so your photo is really something new to me. La Grande: A mirage? You're telling me I, erm, you know, in a mirage? Never mind -- I'll shut up now :-).